Summer in Albania means late night strolls through the city (because it’s too hot to move during the day time). It means endless horns honking, guns shooting, and fireworks blasting. The din of summer wedding season has arrive. There’s a constant buzzing and activity all over the country as people leave their work behind and embrace the spirit of summer. Which in Albania means absolutely no work. It’s kind of amusing actually. Sometimes it feels like Albania is in a constant state of senioritis. It’s too hot in the summer to work. It’s too cold in the winter. It’s too rainy in the spring. So what happens? Very little, to be quite honest. But the one thing Albanians do do best is weddings. And summer wouldn’t be complete without the constant celebratory atmosphere of the wedding season. As soon as the sun comes out in May, wedding bells (or rather wedding “calls to prayer”?) start ringing. Like many other countries in the world, the most popular time to tie the knot is during the steamy summer months. But in Albania, it’s almost exclusive. After a full year in this country, I can honestly say I’ve never heard of a wedding happening anytime other than the summer. So what does that mean? Summer is awfully packed with weddings, as people try to squeeze them in while they can. 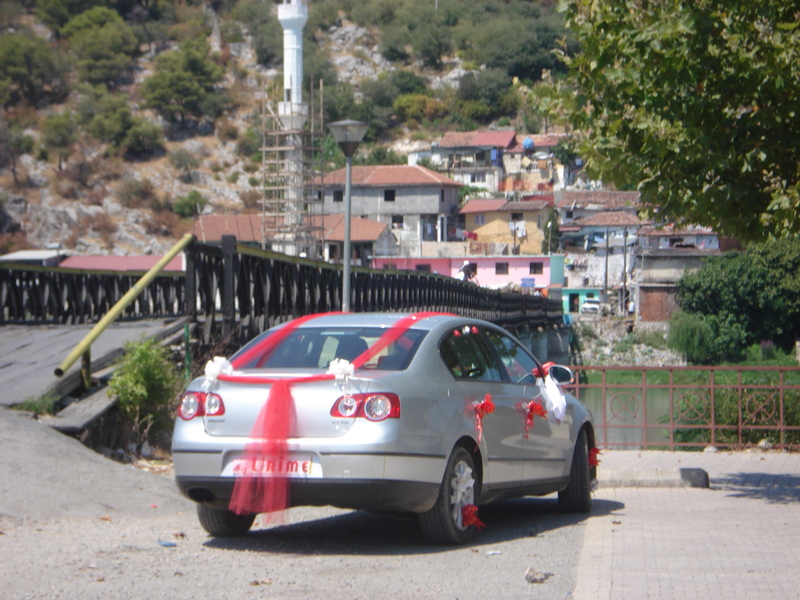 Marriage in Albania is still incredibly traditional. And while there are in fact people here who are progressive, they still adhere to all the customs of their ancestors when it comes to their wedding ceremony. First of all, weddings in Albania aren’t an afternoon or even an evening affair. They last at least a week. The whole week before the wedding, all their friends and family pay visits to the families to wish them happiness in their new union. Then at night, there are engagement parties for the bride and for the groom (separately, at their respective houses) that last the entire week. Needless to say, their neighbors won’t be getting to much sleep as they bump loud music all night long. And don’t forget the gun firing and fireworks that go along with it. 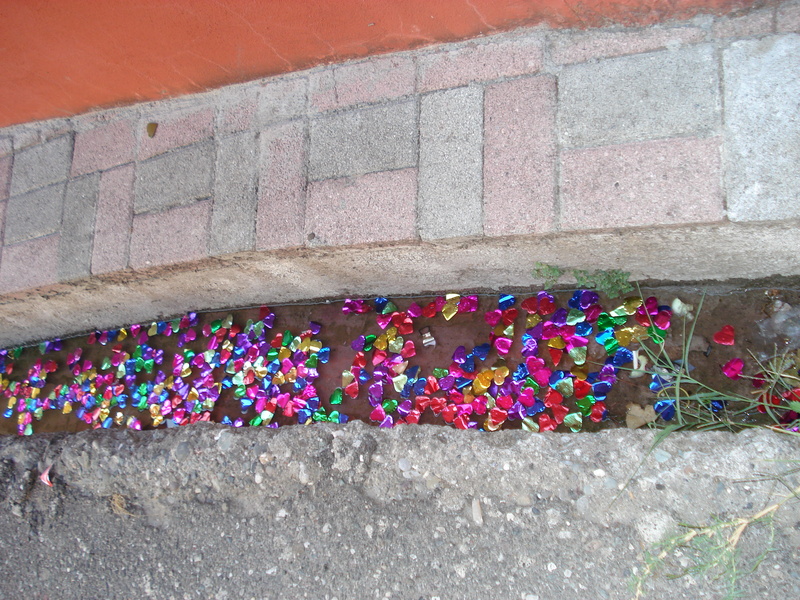 Confetti fills the gutters near my house after a long night of celebrating. So on the day of the wedding, they decorate the car of the groom in lots of ribbons and bows. Then they drive it over to the bride’s house and symbolically take her away from her parents (mind you, the entire month before her wedding she’s been rehearsing for this moment by practicing her crying face). The couple then drives around town followed by the wedding party as they honk their horns continuous…for more than an hour. A groom’s car that’s been decorated for the wedding drive around town. All the while the “best man” and “maid of honor” (they have different words/titles for them in Albanian, mind you) are sitting halfway out the wind of the car filming the entire ride with their videocameras. But no, they are not filming the couple or anything like that. They point the camera at the sky and the stream of cars behind them, honking their horns. I guess that’s what they want to remember from their wedding day? What the weather was like? Who knows. They make a few loops around the city while making pitstops at each of the most important mosques, where they will bow and be blessed by their equivalent of a minister. Finally they end up at the groom’s house, where the bride will live for the rest of her life with her in-laws. As she enters the house, the mother-in-law symbolically bangs her head against the door (gently, of course) to remind her what will happen if she doesn’t obey. And there you have it! The nuts and bolts of an Albanian wedding. Add in feasting, circle dancing, traditional costumes, and general merriment and that’s about all there is to it. To an outsider, it seems strange to see a culture so tied to their past that they go through all these motions even though they have little relevance in society today. After all, divorce does exist here and couples are allowed to buy a new apartment on their own if they can afford it. There are lots of glimpses of modernity in new married couples if you look hard enough. But at the same time, I’m kind of jealous. In the U.S. we have so few traditions and customs because we are a country of immigrants. Everyone brings their culture with them. So for lost people like myself whose families have been in the U.S. for 400 years, what’s my traditional wedding ceremony supposed to look like? Which of the 10 different heritages of mine should I cling to? For that, I’m envious of how proud and traditional Albanians are, and how they can show it off during their wedding ceremonies. Now if only they could do it without keeping me up all night long! Hello, this is really interesting, i like your observations of Albanians and their traditions. I have been reading your last couple of posts and look forward to reading more. I am Albanian myself and live in London and I find it more revealing to read about my country from others, non-Albanians, point of view.